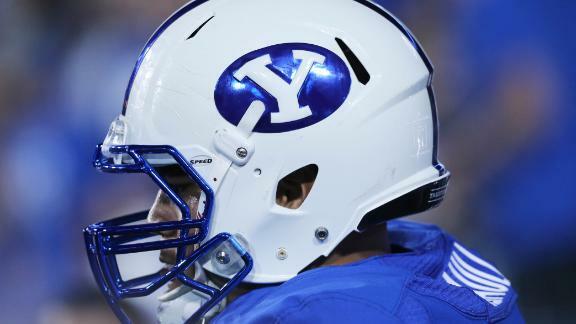 ORLANDO, Fla. -- BYU coach Bronco Mendenhall wants in the Big 12, but two league athletic directors told ESPN there have been "zero discussions" about the conference expanding. Kansas State's John Currie and West Virginia's Oliver Luck both said the Big 12 has not had any expansion discussions, nor is it interested in doing so. "Expansion is one thing we're not talking about," Luck said. Added Currie: "We see how strong and productive our league is with 10 members. The camaraderie is really good." Luck and Currie were attending the National Association of Collegiate Directors of Athletics (NACDA) convention at the Marriott's Orlando World Center. Recently, Mendenhall told the Austin (Texas) American-Statesman that the Cougars "would love to be in the Big 12. I would love to be a member of that conference. I think that would make a lot of sense." However, the Big 12 is not interested in adding teams, Luck and Currie said. One reason is the conference plays every league football team in its nine-game conference schedule and has an 18-game home-and-home round-robin basketball league schedule. "The conference schedule is absolutely great," Luck said. "Our tagline is 'one true champion.'" Luck added that there are no "available teams" -- schools from the non-Power Five leagues -- that would add value to the Big 12's per-school revenue. At the Big 12's annual spring meetings last week, the league announced a record $220.1 million in distribution revenue, earning the Big 12 more per school in revenue than the SEC and ACC. "Our denominator is 10," Luck said. "The more you split it up ... I don't think we can find a partner who's available right now to stay at the value we have (per school) or let alone increase what we have. That's the consensus we have (staying at 10)." While conference expansion has slowed considerably, Luck revealed a plan he had three years ago that would have merged teams from the Big 12 and Big East conferences. In September 2011, the Big East was stunned by the departures of Pitt and Syracuse, and the Big 12 was in danger of losing four schools to the Pac-12. "My favorite story that hasn't been written," Luck said. "After Syracuse and Pittsburgh (announced they were leaving for the ACC), that was in the same time frame that Texas, Texas Tech, Oklahoma and Oklahoma State were playing footsie with (Pac-12 commissioner) Larry (Scott) and the Big East was a mess." So Luck began cold-calling athletic directors at Baylor, Kansas, Kansas State and Iowa State with a proposal. "I didn't know those guys from Adam," Luck said. "I knew the schools. I told them, 'Your conference may fall apart. You guys look like you might get left behind. Why don't we take all of you and TCU, which was kind of homeless." Luck's plan, which also had the support of Louisville athletic director Tom Jurich, was also to add UCF for a 12-team Big East divided into two divisions: West: Baylor, Kansas, Kansas State, Iowa State, TCU and Louisville; East: UConn, Cincinnati, Rutgers, West Virginia, South Florida and UCF. "I remember thinking: 'That's not a bad conference,'" Luck said. "And we would have kept the affiliation with the (Big East) basketball schools, because they loved the addition of Kansas. They (the Big 12 schools) also liked it. They were nervous as hell, too. We had a series of phone calls. That was sort of our best option." Luck said he had three or four phone discussions with the Big 12 schools. Then-Big East commissioner John Marinatto was not involved in the discussions and no formal offer was extended, but the Big 12 schools -- if left behind by the schools headed to the Pac-12 -- were prepared for the merger. "At that point in time, we were ready to flip the switch," Currie said. Of course, the merger never happened. Although Texas A&M and Missouri left the Big 12 for the SEC, Texas and Oklahoma remained in the Big 12. The Big 12 survived, but the Big East eventually lost a number of schools, including -- ironically -- West Virginia to the Big 12 a year later. "I think (the proposed merger) may have helped us get in the Big 12 later," Luck said jokingly. "They were like, 'Hey, I've talked to that Luck guy before.'" Brett McMurphy discusses why BYU would be interested in joining the Big 12, as well as why some schools already in the conference would like to keep them out.